Early morning on September 18th, a quick look across Mosport and 21 FSAE teams were ready to race. The UofT Shootout is a student-run FSAE competition, hosted by the UofT Racing team. No presentations, no reports but a full day of autocross racing. The event attracts FSAE teams from all over North America, with our farthest partipating team Missouri S & T travelling over 1500 km to compete. The event is located at the Mosport Kart track, featuring a technically chal lenging course with a variety of elevation changes. Drivers race timed taps to be ranked on both an individual and team basis. The day began at 7:30 a.m , with a technical inspection and driver meeting. Track opened at 9:00 a.m with UofT’s 2007 vehicle running the first lap. At 11a.m., lunch was provided by Three Star Catering – a local Bowmanville company. Participants and spectators alike had the opportunity to check out the free swag and music at Scion’s vehicle display. Late afternoon, though cloudy, did not bring rain for the last lap at 4 p.m. Teams gathered for the award ceremony at 5 p.m., with over fifteen prizes to be won. The 1st Place Overall winner went to ETS. Detailed results can be found here. The U of T Racing Team would like to thank Laurence Polley from C & R Engineered Solutions for performing technical inspection on all Shootout vehicles and ensuring a full day of safe racing. We’d also like to thank our volunteers – including 50 undergraduate students, who helped marshal the track and keep the day’s events running smoothly. 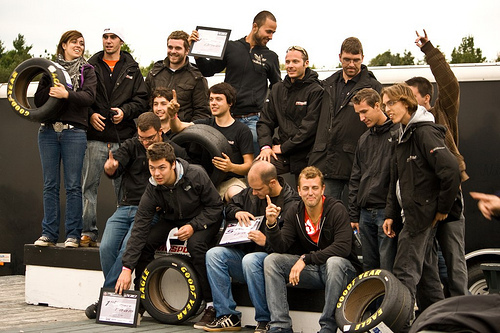 The 2010 U of T Shootout would not have been possible without the support of SAE Central Ontario, Mosport International Raceway, C & R Engineered Solutions, The Bridgestone Racing Academy, and Scion. Thank-you to all of the participating university teams, spectators, and volunteers that made this event such a success, and best of luck in the 2011 season.